This is a book about North Carolina and a little church group there and a family that has a lot of bad stuff happen to them. Book bloggers, many that I like a lot and who usually don't steer me wrong, raved about this book and so I've been meaning to read it for ages. (It showed up unsolicited last year I guess) I finally decided to take the plunge. I liked the book but I don't think I liked it as much as I wish I did. I mean it should have been right up my ally but then it wasn't. 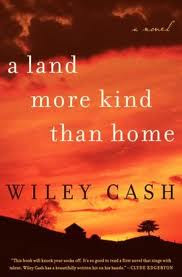 A Land More Kind Than Home is told from three different points of view--Jess's (a young boy) point of view, an older lady in the church, and the sheriff. To be honest, I don't even really know why this choice was made except that there was some information that had to be dispensed in that way. Some context if you will. Anyway, Jesse has an older brother, Christopher, who doesn't speak but one day he sees something he shouldn't which leads to a chain of very tragic and unfortunate events. Objectively speaking, this is a good book. It's well written, it evokes a sense of place, it works with its subject matter very effectively using the crates of snakes as symbols of the dark and scary parts of ourselves, our secrets, and our past. I just never really connected with it in the way that I wanted to. I felt like I somewhat reasonably predicted the trajectory of events and some of the stuff that got set up never really built into anything intriguing. So...I don't know. It's a good solid book, just not one I ended up loving. ALSO, the charismatic cult leader/pastor dude was from Toccoa where he did a bunch of bad stuff. I always love stumbling across references to Toccoa of course, so it's noteworthy even if it was the place where he did a lot of really bad stuff. Anyway, I guess I felt like the book didn't delve into the hows and whys of the belief of the little church group enough. I was just reading something where the author said he wanted to explore people who believe something to death but I don't feel like this book is really about belief at all strangely enough. Anyway, a lot of other people liked it a lot more than I did. And you know, I didn't hate it or anything it just wasn't a book that intrigued me, or made me think about things differently or that got under my skin or whatever.